Google has done it hard in China. Confined to acting within both local laws and US copyright laws it has failed to take the lead in a market that will have more broadband users that the United States in the next 12-18 months. The NASDAQ listed Baidu dominates mainland search, in a big way due to its thorough indexing of illegal music and video and related search capabilities, a service that Google either refuses to or cant compete with. It would seem that it’s not just MP3’s that bring Chinese users to Baidu, it appears that ISP level redirects do as well. China NetCom is a major player in the Chinese ISP market and is the second biggest provider in the country. We can’t confirm as yet whether this is a one off restricted to just Shanghai or applicable to all China NetCom access points. 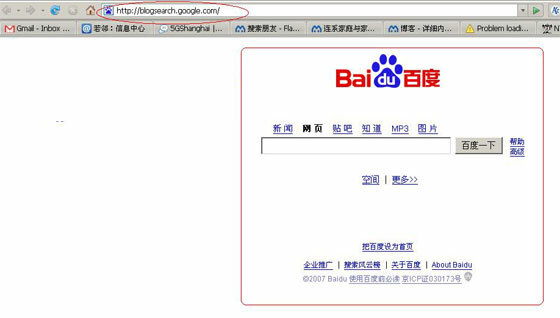 We also don’t know whether this is an initiative of Baidu or China NetCom, or both. Given both are listed in the United States they should rightfully answer as to whether they are indeed hijacking Google traffic; after all, it’s not very sporting of them to do so. Update: the redirects are more widespread than we first thought.